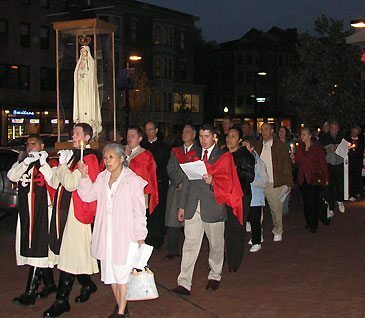 Someone walking down Tremont Street in Boston on Friday evening would have seen an unusual sight: 125 Catholics gathered around a large statue of Our Lady of Fatima, devoutly kneeling, holding candles and praying the Consecration to Jesus, through Mary, written by Saint Louis de Montfort. Throughout its history, the “opera” has earned its blasphemous reputation. In London, the debut was the subject of a libel suit for defaming Christians. When it was to be aired on the BBC, it drew more than 60,000 complaints. In face of such insults to the Faith, America Needs Fatima could not and did not remain silent. To make sure people knew where the protest was to take place, at about 5:30 p.m., on-site preparations started. This included unfurling banners and setting up signs, the raising of large TFP banners, the distribution of prayer programs and metal megaphones to the prayer leaders. This last item was especially important since we had been denied the use of electric amplified sound. Everything was ready on time. 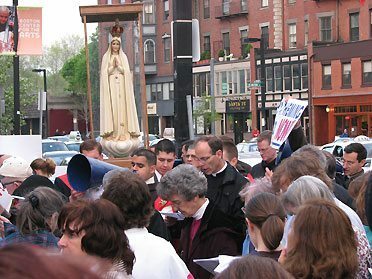 At 6:15 p.m., the protest started to the sound of “Hail Holy Queen Enthroned Above” as the Pilgrim Statue of Our Lady of Fatima was carried shoulder high in procession and took her place at the front of the crowd, where she reigned throughout the protest. Three well-dressed ladies that were on there way to a fashion show were surprised to see the protest in front of the Boston Center of the Arts. After a few seconds of hushed conversation, they abandoned their program to join the Catholics in prayer and protest. New Englanders don’t do things in half measures. Most people passing by could not join the prayer vigil, but still extended their sympathy. A college student on a bike, stopped and made the sign of the cross, then bowed her head for a few moments before making the sign of the cross again and cycling off. A large banner informed the downtown traffic about the purpose of the protest. One of the cars stopped and the occupants said a Hail Mary with the protesters before driving off. The objection raised by the Springer supporters is the same old, worn-out one we have heard over and over for years, which holds no water. For the lack of a better objection, they pretend that one needs to have a direct and firsthand experience of everything to make a judgment whether it is right or wrong. This is ridiculous since it is impossible to know all things from direct and firsthand experience. The sympathizers of blasphemy themselves do not and cannot live according to this principle. Every day, we make numerous decisions on second hand information, by what others tell us is true. We use maps designed by other people to find places we’ve never been to. We read books that narrate stories we have never witnessed. We eat food people say is healthy for us, simply because they say so. We pay money to see movies of animals, people and places we have never seen directly, such as a nature documentary on the ocean floor, or about the Amazon jungle. People going into the theater to watch the blasphemous production were very different in many ways to those standing outside in prayer. For example, the Catholics looked with devotion and hope upon Our Lady’s statue; the theater goers refused to look at the statue of Our Lady of Fatima. The people praying were calm. The people going into the theater were agitated and burst into spurts of mockery and laughter, which were followed, by a type of sad and guilty somberness. This agitation was most noticeable when the prayer warriors took out candles and lit them, and knelt down to pray the consecration to Our Lady – like in a church, right there on the sidewalk in front of the theater. The theater goers tried to laugh it off. However, they felt the impact and within minutes, they melted away. As Catholics, we know that there is and can be no peace on earth between good and evil. This blasphemy play is part of an agenda to insult God and to drag as many souls to Hell as possible. However, we also know who will win in the end. The spiritual war against blasphemy can only have one winner: the Immaculate Heart of Mary. Until that glorious triumph arrives, it is our duty and honor to oppose blasphemy, to offer reparation, and to win as many souls for Our Lady as possible. I believe Our Lady will show special mercy and goodness on the day of her triumph to those who upheld her honor in the times when sin seemed unstoppable. This entry was posted in Events of 2009 and tagged BBC, Catholic spirit, Catholics Oppose Blasphemous Jerry Springer, Heaven, Hell, Immaculate Mary, mercy, O Sacred Heart of Jesus, Our Lady of Fatima, Prof Plinio, the Opera in Concert, Tremont Street Boston by Robert Ritchie. Bookmark the permalink.